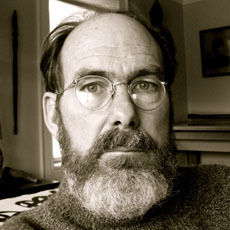 In 2007 John Snyder returned to the Midwest after having lived in North Carolina for 13 years. John lives just outside the lovely small town of Decorah, located in the hills of Northeast Iowa. His early work of portraiture and figurative painting, carving and sculpture, was strongly influenced by a mix of 19th century American folk painting, self-taught artists, the Hudson River School, and early Italian fresco painting. This work culminated in an exhibit at the Walker Art Center in 1992. Upon leaving Minneapolis in 1994, John began in earnest to create imagery specifically about a personal vision he called the "Church Of The Unknown", which included porcelain slip-cast and mosaic figures, woodcuts and wood carvings while living and working in North Carolina from 1995 -2006. This included a 2-year residency at The Penland School Of Crafts where he found himself drawn to the beauty of traditional craft, in particular wood-fired pottery. In 2003 John paid homage to a long and dear held influence, 13th c. Italian fresco painting, with an exhibit at the Weinstein Gallery (Minneapolis) that included several large allegorical murals. My interest in painting shifted sharply following this exhibit and I began creating drawings, paintings and woodcuts inspired by African and Oceanic Art, as well as Buddhist Cave Temple painting and sculpture. After having completed in 2010 exhibits at both the North Dakota Museum Of Art and at ArtHaus (Decorah), John finds himself once again returning to figurative painting. In addition, he is currently setting-up a printmaking studio at his home.